1. Keep your backpack organized and in control. Put all of your items in this backpack organizer then place it in the backpack you are going to use for the day. You will never have to rummage around your bag for those keys or purse again. 2. Keep away from mess and not afraid of Scratch the phone,hard drive,special pockets for your small laptop or pad.find the key everywhere,looking for your lipstick,purse in hurry. 3. High quality and durable nylon material and zipper with metal brand logo,elegant and beautiful. 4. Bag insert organizer for every women and men,it is perfect gift for your friends. 5. Perfect for travel,work ,class and so on. 3 Size Available: Could be used as handbag organizer, purse organizer, diaper bag organizer insert, pocketbook organizer, cosmetic bag etc. Suitable for most size of backpacks and large tote bags.Small size: 8.9"*3.5"*9.6" Medium Size: 10"*4.3"*11.2" Large Size:11.2"*5.1"*12.8", please check your bag size before your purchase. 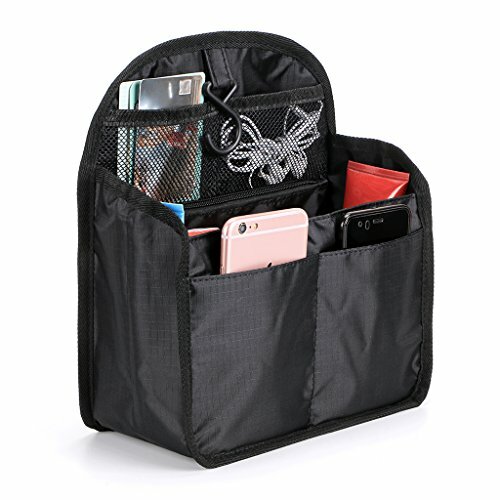 Large Capacity: There are 10 pockets to help better organize, It is deal to organize portable supplies like magazine, notepad, textbook, pen, lipstick, ipad, laptop, water bottle, umbrella, chargers, diapers, feeding bottle and so on.You can arrange your stuff sensibly. Converts Into A Hanging Backpack Insert: Easily lifted out with the hook,You can remove it with all of you items in it and insert it in another bag/tote very easily.This also means that you can access your items conveniently by hanging the bag. Kindly note:In order to get the best storage effect,we suggest you to measure the size of your outsourcing before placing the order. And choose the insert bag 1-2cm smaller than your outsourcing.